Outside Sunday’s “Lovely, Still” showing, reps Cassian Elwes (from William Morris) and Cynthia Swartz (from 42 West) worked an end of hallway after the screening, while Knudsen and Van Hoy greeted well-wishers. Fackler’s first feature had just stirred an emotional response among a number of those who connected with his story of an aging romance, starring Martin Laundau and Ellen Burstyn. The small town story walks a tightrope and then takes a dramatic turn at its climax, leaving viewers both heartbroken and uplifted. 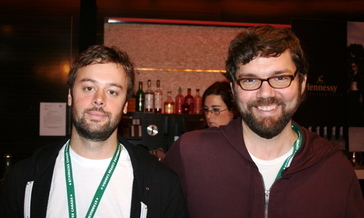 Producers Lars Knudsen and Jay Van Hoy. Photo by James Israel/indieWIRE. “If the actors were my age, it wouldn’t be a big deal,” Fackler told indieWIRE, when asked whether people are focusing too much on the fact that, at age 17, he wrote the story of these two older lovers. Now 24, he seems to take the questions in stride. William Morris’s Craig Kestel, rep to such filmmakers as Ryan Fleck and Anna Boden, Ryan Eslinger and The Duplass Brothers, found then music video director and artist Fackler’s website. He later packaged the film, concealing the would-be filmmaker’s age until after the connected with the script. They would eventually work with Jack Turner and White Buffalo Entertainment to get the movie made and on the fest circuit within a year. Ellen Burstyn reiterated a particular fondness for filmmakers at an early stage of their careers. She worked with Martin Scorsese, Peter Bogdanovich and Darren Aronofsky early on. Explaining to indieWIRE that she relishes the chance to work with a director before they’ve been through the “meat-grinder” she noted that emerging filmmakers are less likely to second guess themselves when they have less to prove and have not yet faced too much failure (or success). Buzz is growing for Fackler’s feature, but those involved are still mapping out the best release strategy for the picture. The team is taking the temperature of buyers, while balancing a hope to get the movie — set during the Christmas holiday — out at the end of the year to make the most of post-fest (and awards) buzz. If they decide not to sell the movie, don’t be surprised if they take a high-profile DIY approach. In last week’s biz assessment ahead of TIFF, indieWIRE’s Anthony Kaufman noted that marketing consultant Matthew Cohen is already on board to help with distribution. Domestic violence takes the spotlight in Indian director Deepa Mehta’s “Heaven on Earth.” Starring Bollywood actress Preity Zinta and actor Vansh Bhardwaj, the film opens with colorful festivities celebrating the wedding of Chand (Zinta) and Rocky (Bhardwaj) but fades when the bride is taken to her new home in Canada and the reality of a violent home life takes root. 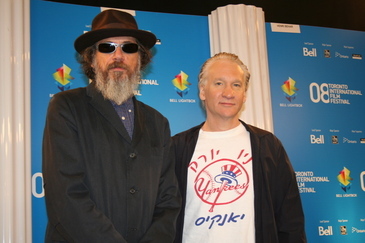 Director Larry Charles and comedian Bill Maher at the Toronto press conference for their film, “Religulous.” Photo by Brian Brooks/indieWIRE. “Borat” director Larry Charles and comedian Bill Maher take on the final sacred cow by tapping their irreverance to stroke the slippery slope of skepticism when it comes to the God issue in their film, “Religulous.” Maher travels to some of the holiest sights in the world for some of the biggest names in monotheism: Jerusalem, Vatican City and Salt Lake City to openly polarize and debunk what Maher sees as the ridiculousness of religion.